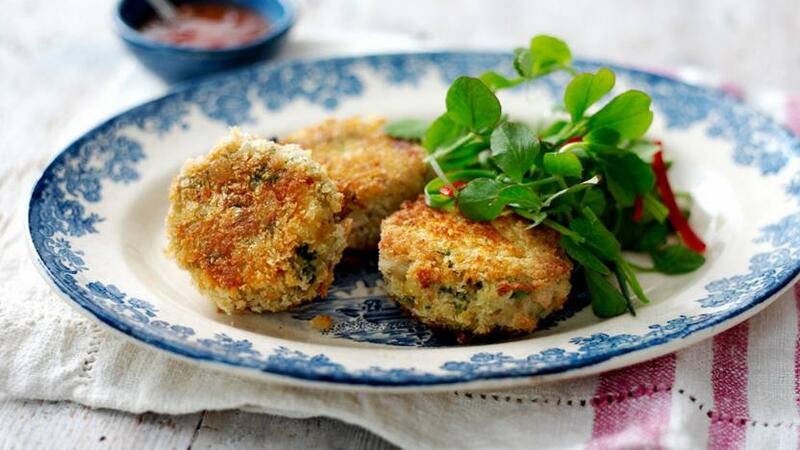 Whip up delicious ginger and coriander-tinged crab cakes when you’re pressed for time. Place the ginger and chilli into a mini food processor and pulse until finely chopped. In a bowl combine the chilli and ginger with the white crabmeat, coriander and spring onions. Crack in one egg and mix well, then stir in 4 tablespoons of the breadcrumbs. Divide the crab cake mixture into 6 equal portions and mould into patties. Place on a tray and chill in the fridge for about 20 minutes before cooking. Beat the remaining egg in a small bowl with one tablespoon of water to make an eggwash. Place some plain flour and the remaining breadcrumbs in separate shallow dishes. Dredge a crab cake in the flour, then dip into the egg and coat in the breadcrumbs. Shake gently to remove any excess breadcrumbs. Repeat with the remaining crab cakes. Heat the olive oil in a frying pan and fry the crab cakes for 2-3 minutes on each side, or until crisp and golden-brown all over. Transfer the crab cakes to a baking tray and bake for 5-10 minutes, or until piping hot all the way through. Serve the crab cakes with sweet chilli jam and a mixed leaf salad, lightly dressed with olive oil, salt and freshly ground black pepper. These crab cakes can be prepared the day before and left in the fridge overnight before cooking.